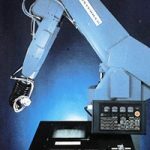 As early as the 1970s, several finishing equipment companies partnered with robotics firms to expand what at the time was a newly emergent powder application industry. The leadership of Modean Industries was at the forefront of this development. While robotics companies in Sweden and Italy were developing interesting products, the ones that really caught our attention were from Japan. Here, Toyota’s automotive plant had an impressive group of 21 robots tasked with welding cars on an assembly line. At the time, it was all so new that it seemed like a scene from a science fiction movie. It was amazing watching this robotic army at work! However, the thing that left an even more lasting impression on us was a visit to a small mom-and-pop job shop where they were coating electric motor covers mounted on a chain-on-edge conveyor. During our first meeting with the company’s representative and its owners, in the background, I noticed that the conveyor was moving, but I didn’t see any employees in the plant. How could the system be working without anyone to load and unload the parts – never mind coating the covers? Just as I was formulating this question, a red light and bell started flashing and ringing! The owner’s son left us and ran to the light. At the invitation of the representative, we followed him into a small room where a large sized robot had stopped because its powder hopper was empty. The son refilled the fluidized powder hopper, pushed the button on the robot and it then resumed spraying the parts. While the electric motor cover rotated, the robot carefully sprayed the entire cover from one side to the other, then repeated the application on the other side as well. Our next stop was the load / unload area where a small “pick-and-place” robot was stationed. The mini robot unloaded and then immediately reloaded the parts. Watching this scene, I was mesmerized by the combination of simplicity and efficiency in the process. I thought to myself: the robotics setup makes perfect sense not just for big companies, but for small ones too. Upon my return home, however, the consensus among American businesses seemed to be the exact opposite. Many believed that only big corporations would be able to afford robots or be able to train employees to use them. And then there was the fear factor to overcome: robots were intimidating. But I was determined to see this through, so I returned to Japan to learn more about their deployment of robotics technology. Ultimately, I was successful in negotiating a contract with Hitachi, one of the earliest companies to actively advance robotics research in Japan. Interestingly, two significant modifications just had been introduced. First, the robots had gotten switched from hydraulic to electric power, which made them lighter and easier to work with. But second, and even more impressively, the new robots didn’t require a human operator. All the robot needed was an initial command to coat the required part and then the robot independently would complete the task. It was a tremendous breakthrough. It was this Japanese robot that my company introduced to the U.S. coating industry. Not long after we initiated our marketing effort, we received a contract from GM to customize a liquid coating gun for use by a robot. At the time, most coating gun manufacturers contained a very stiff high tension cable, but this presented an array of practical problems for the company. To meet GM’s requirements for a more flexible cable, we developed a gun with two spray nozzles and a power supply embedded in the gun’s stem. 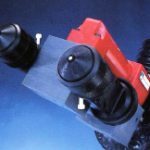 In the end, the project was such a success that GM and the Japanese robot manufacturer partnered to sell a robot that used our coating gun. The moral of the story is simple: the powder coating industry continually must reinvent itself as new technologies emerge. And we shouldn’t assume that powerful new technologies only will be relevant to large companies. There are many powerful applications that can be ground-breaking for smaller companies as well! Of course today’s robots have advanced considerably. Robots now are nibbler, lighter and capable of 3D operation. This enables them to “see” from multiple angles. This makes them much safer. Additionally, some robots are light enough to be easily moved from one location to another. In the context of such dramatic developments in robotics and artificial intelligence, we should be asking ourselves: How might these remarkable technologies be able to positively impact the coating industry? In many ways, robotics could be a boon to manufacturers, allowing them to retrain and refocus their workforce for more creative jobs. Robots can then be the “worker bees” for tedious, repetitive tasks, or for tasks that require a high level of physical accuracy such as painting. A robot with 3D capabilities is now able to “study” a sample and then automatically duplicate that sample’s coating on products presented to it on a conveyor. Today, two robots are capable of replacing eight automatic coating guns on reciprocators, as well as two touch-up stations. In the long run, I believe that such innovations in robotics will be a tremendous benefit to American companies and American workers. Take this case from Boston Dynamics as an example: Here, a human and a robot collaborate to get the job done. The worker is assured of a reliable operating partner and this allows him to use his time more creatively — to manage processes, simplify operations, eliminate application rejects, reduce downtime, etc. Imagine the possibilities for a more productive, competitive and forward-thinking powder coating industry! It can be done and it’s only the beginning! 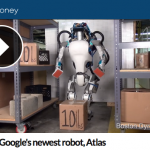 Look to the future for man and his partner … the robot!